Tilted Height Lines by ACSYS - Realistic 3D Effect without Depth engraving! 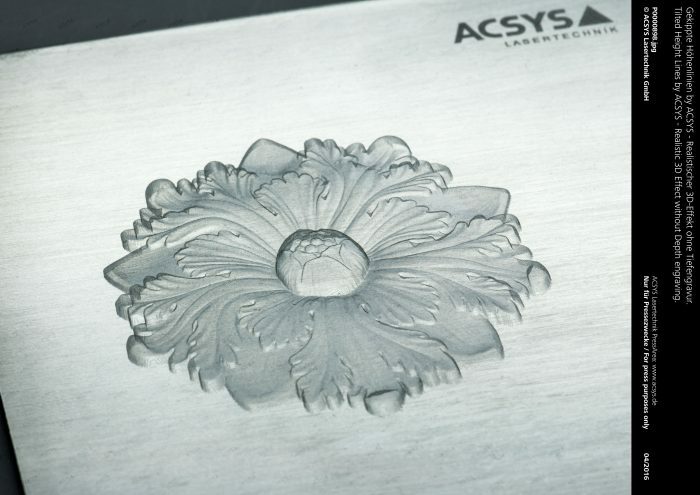 - ACSYS Lasertechnik UK Ltd.
Tilted Height Lines by ACSYS – Realistic 3D Effect without Depth engraving! The intelligent arrangement of two-dimensional lines, the impression of three-dimensionality arises. Tilted Height Lines by ACSYS. 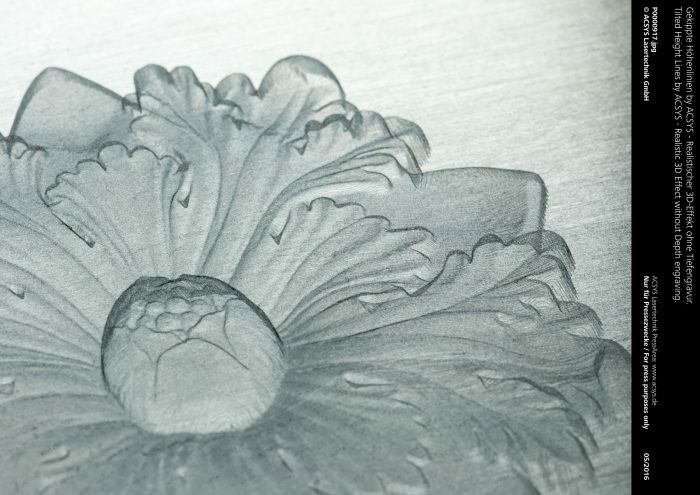 This designation stands for an intelligent technology to reproduce three-dimensional CAD reliefs with simple lines on most different materials. The lines are generated in the software (AC-LASER) by ACSYS. In the Software the lines cover the CAD Relief and follow the height profile contained therein. The viewing angle on the relief can be freely selected. The result is an optical 3D model, the laser processing however, is purely two-dimensionally. The advantage is very fast processing times with a simultaneous very high surface quality. Common applications for the technology are all industries with high standards on optical quality. The Tilted Height Lines can be used for optical enhancement or as a unique feature of sophisticated designs. By absolute reproducibility also applications as security features are conceivable. The lines can be directly applied to the workpiece, but they can also be embossed or molded.